The Vegas Golden Knights were over-the-moon happy to win Game 1 of the Stanley Cup Final. How they got across the finish line is another matter entirely. The Vegas Golden Knights were over-the-moon happy to win Game 1 of the Stanley Cup Final. How they got across the finish line is another matter entirely. Vegas put in an uncharacteristically sloppy defensive showing in Monday's chaotic 6-4 victory over the Washington Capitals, a back-and-fourth tilt that saw a Cup-record four lead changes. Inching ever closer to an improbable championship in their expansion season was nice, but the Knights know there's lots to clean up ahead of Wednesday's Game 2. "Small margin for error out there — one turnover and you find it in the back of your net," Vegas forward James Neal said after Tuesday's optional practice. "We've got to be a little bit better coming out of our end ... when we get in the offensive zone, be a little bit better there." The Knights had a seven-day layoff in the wake of beating the Winnipeg Jets in the Western Conference final, while the Capitals had four days of inaction following their triumph over the Tampa Bay Lightning to capture the East crown. "After a long break for both teams, it's going to be a little wild," Vegas defenceman Shea Theodore said. "They're going to tighten up a lot of things and so are we." There are just three players in the series with previous Cup experience — Neal, Knights netminder Marc-Andre Fleury and Capitals defenceman Brooks Orpik — so nerves were probably a factor in some of the lapses that resulted in a 10-goal outburst. 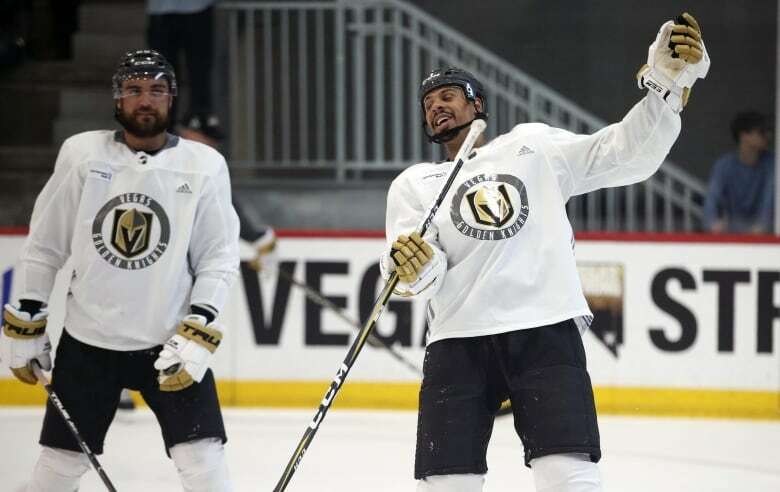 The ice was also an issue on a couple of occasions as workers had to deal with problem areas at T-Mobile Arena with scorching temperatures outside and a late-afternoon puck drop in the Nevada desert. "Neither team played their best game," Knights forward Pierre-Edouard Bellemare said. "The break, the stage, the final ... guys being a little bit more stressed than they are usually." Both clubs were loose in the neutral zone and in the danger areas in front of Fleury and Washington counterpart Braden Holtby, although neither netminder was in top form. "The chances were pretty close, and they're a lot higher than most teams give up in a playoff game," Vegas head coach Gerard Gallant said. "Both teams will be a lot better. "It wasn't the best game, but it was an exciting game. When you go through the chances there were 2-on-1s, there were lots of opportunities. I'm sure it was great for the fans." Washington, meanwhile, doesn't have the luxury of feeling good about the result in spite of its performance after allowing six goals for the first time since March 18. "I don't think we executed our game plan 100 per cent," forward Tom Wilson said. "We didn't play the game the way we wanted to, and we were still in it. We did a good job clawing back into it and making sure we stuck around. "In the third we're up a goal on the road in a tough building. Hockey's a game of ups and downs, and we're focused on the next one." The Capitals, who closed out Tampa Bay with back-to-back shutouts, led 2-1, 3-2 and 4-3 in Game 1, but allowed the Knights to claw back each time. "There's a couple moments where maybe if you control those a little bit better then the outcome's different," Wilson added. "There's going to be little breaks, there's going to be stuff that goes on. You've got to try to keep pushing forward." Washington fell behind the Columbus Blue Jackets 2-0 to open the playoffs — on home ice, no less — and dropped the opener to the Pittsburgh Penguins in the second round. Needless to say, the Capitals have been here before. "You've got to bounce back regardless of the scenario," said defenceman John Carlson, who scored once and hit two posts in Game 1. "We know what our capabilities are as a team and what kind of game-style we're able to push. "We've got to get back on our horses." 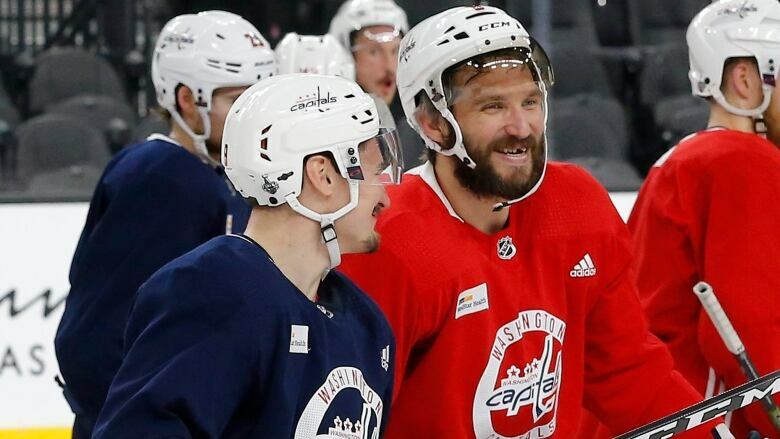 The Capitals learned prior to their practice Tuesday that Wilson wouldn't face any supplemental discipline from the league following his controversial hit on Vegas forward Jonathan Marchessault with the score tied 4-4 in the third period of Game 1. The big winger caught the diminutive Marchessault admiring a pass, but the Knights contended the play should have resulted in a major for interference instead of a two-minute minor. "It was a close hit. It was a borderline hit," Gallant said. "It was a late hit, for me. "The good thing about the hit is it really woke our team up ... it got our guys a little upset, they played hard and found a way to win the hockey game." Wilson felt decidedly different Monday night, and that opinion hadn't changed by Tuesday afternoon after watching the replay in slow motion. "It was within the rules and a good hit," he said. "Looking forward to playing the next game."